Anxiety can be defined as a normal human emotion that is the result of a perceived threat. Everyone experiences anxiety at some time or the other. As a matter of fact, anxiety is also considered to be adaptive as short-term anxiety often helps in enhancing performance and avoiding danger. 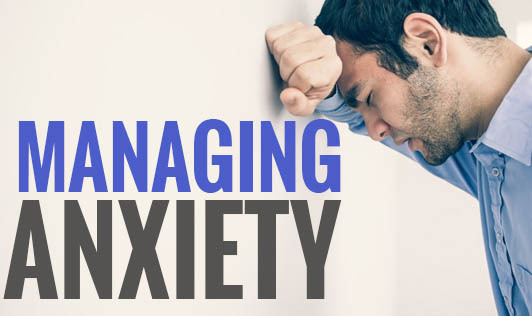 But long-term anxiety issues can cause so much distress, that it can interfere with basic functioning in normal life. It is always wise to seek help from a physician or a counselor for dealing with prolonged, severe anxiety. The common symptoms include: rapid heartbeat, poor sleep, irritability, worry, tension, muscle pain, and appetite changes. Exercise regularly. It releases endorphins and boosts happiness and self-confidence. Understand your anxiety triggers. Learn to recognize the situations that make you anxious. Plan a detailed step-by-step process on how to get through anxiety-ridden situations. Learn to detect anxiety symptoms in yourself. Practice slow, deep-breathing when you start to experience anxiety symptoms. Win with logic. When you have fearful thoughts, try to reason if they are valid or not and challenge your argument with rational explanations. Use meditation and relaxation techniques. Remember, learning to manage anxiety is like learning to exercise. Keep at it and you will be successful in getting over it. Practice is the key.